WHY IT RATES: Partially built within a historic building dating back to 1870 that was the former home of a Civil War Union General, Moxy D.C. is truly unique property.—Mia Taylor, TravelPulse Senior Writer. 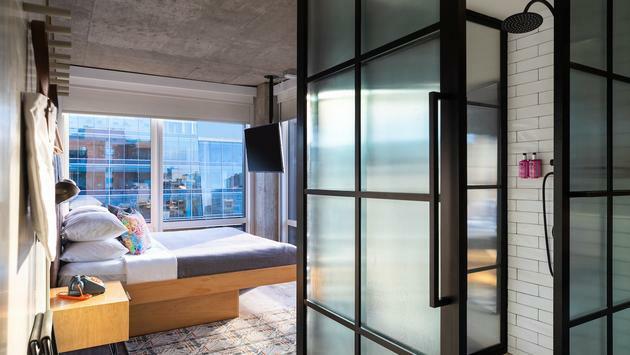 Today, the experiential and spirited Moxy Hotels, part of Marriott International, officially opens its doors to guests and the local Washington D.C. community. The new Moxy D.C. will boldly reinvent the lifestyle hotel experience in the nation’s capital, positioning itself as the ultimate destination for engaging, smart and free-spirited travelers. Partially built within a historic building dating back to 1870, the former home to a Civil War Union General, Moxy D.C. is a hotel that embraces the city’s past with an eye to the future. The hotel’s interior design, led by Dash Design, is industrial chic; where style meets function throughout the 200-room, 14-story hotel situated on 1011 K Street NW in downtown D.C.
Polished concrete floors, exposed concrete columns, and open ceilings give way to a vibrant art-filled lobby, featuring original work by local D.C. artist Michael Crossett and a video art installation by international artist Rahul Jhad, winner of the hotel’s #BlankCanvas campaign competition. With more travelers spending time in common areas, guests can hang at their own pace in the lobby – on a couch with mobile device in hand or take in a lively scene at the bar with a beverage in hand: think living rooms with a bartender. Targeted to the Fun Hunter, Moxy D.C.’s experiential concept fully embraces a different approach to hospitality. Rather than a traditional check-in counter, guests walk up to the bar and are handed a complimentary signature Got Moxy! cocktail with a room key. Bedrooms are smart and flexible, featuring mobile check-in and check-out; keyless entry; motion sensor lighting; internet TV, abundant power and USB outlets; and furiously fast and free Wi-Fi for ultimate connectivity. To ring in the hotel opening and introduce itself as the newest destination to play and stay in The District, Moxy D.C. will debut itself with an untraditional opening ceremony on December 4, 2018, followed by a series of opening events open to both guests and the local community. More details on Moxy D.C.’s programming can be found at www.MoxyHotels.com.